Kurkov’s understated humour and perfect, deadpan style makes this quirky little story, full of quirky characters, a gem. 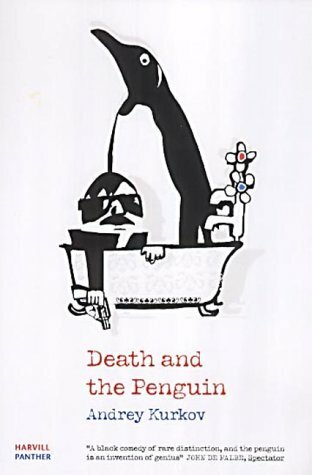 Death and the Penguin is the nectar of booklovers and Misha, a penguin rescued from a struggling zoo, is one of the most animated, engaging and touching characters in contemporary fiction. But there’s more to Kurkov’s writing than a sideways laugh at human foibles. Death of Penguin shows many pictures of loneliness and human isolation. Viktor is an aspiring writer but lacks the energy to follow his dreams and, by settling to bread today and giving up on the idea of jam tomorrow, finds himself drawn into a mafiaesque world of crime and assassination in the chill starkness of post-Soviet Kiev. Misha comes to live with him when the local zoo can no longer afford to feed him. Both are lonely, Viktor isolated from human society and Misha alone amid it. Yet it is Misha who seems able to make strong relationship – first with Sonia, a little girl who comes to live with Viktor when her father is swept away into oblivion by his life of crime and then with the reader: who cannot fail to adore the quite, reliable, predictable animal, or to delight in his pleasure in fish and cold bathes, or sorrow over his inability to adjust to life in a climate so much warmer than his native land. Here too is a stark, if one-sided, portrayal, of life in the former Soviet state of Ukraine. And it’s not a nice life. It’s cold, it’s hard and seemingly pointless. Deprived of the structure of the state, each seems to struggle to embrace with vigour the concept of democratic freedom. What Death of the Penguin amounts to is a strong indictment of a political reform which has left a population, bereft of communism community, without any societal fabric at all: without hope, without security and unable to realise the promise of liberty. This book is very funny. It’s very sad. And it’s very, very good. Great review! Quirky with strains of truth? Thank you! I’m in the process of transferring reviews onto this new blog site, and in the process being reminded and revisiting a lot of old friends. I think I might just have to read this one again!